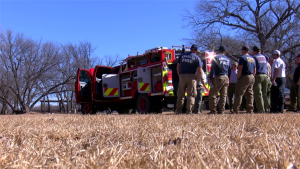 Numerous firefighters were out in Burkburnett Wednesday afternoon getting some training on a new brush truck the Burkburnett Volunteer Fire Department is adding to their fleet. Captain Jared Burchett, with the Burkburnett VFD, said this is the first of its kind in Wichita County and is also qualified as a TIFMAS ready truck. More details about the new truck can be found here.